Egypt's major cities may still be crammed with rush hour traffic but the president says things are gradually getting better. During his Saturday speech, Mohamed Morsi noted the looming end to his first 100 days in office and announced that 60 per cent of Egypt's traffic crisis had been resolved. The country's chronic traffic problem was one of five issues Morsi had pledged to address within his first three months, along with fuel and bread shortages, garbage collection and improving security on the streets. "Everyone can see that traffic police are back on the streets to a very large degree," Morsi told the 70,000-strong crowd gathered in Cairo Stadium to mark the 39th anniversary of the October War. White-clad officers are becoming a common sight on Egypt's streets, in contrast to their palpable absence in the aftermath of the 2011 uprising. But Morsi's assertion that he's solved the greater part of Egypt's traffic congestion is strongly contested, both by members of the public and political figures. "There's no difference, everything is the same," said taxi driver Hussein Ahmed, pulling his cab over to the kerb just off Tahrir Square. The epicentre of last year's uprising has just recently begun to see the return of traffic police. "We only see them in the squares," said Hussein, gesturing to the officers as they directed the streams of traffic. The Strong Egypt Party, founded by expelled Muslim Brotherhood leader and presidential contender Abdel Moneim Abul Fotouh, pointed out the contrast between Morsi's promises and his actions. A party statement suggested the percentage figures used by Morsi to denote his achievements were a "phenomenon of random figures" lacking reference and precision with little relation to the situation on the ground. It focused specifically on Morsi's claims of improvements in traffic flow, saying that the 60 per cent success rate contradicted "the reality of traffic chaos" in all of Egypt's major cities. Such accusations stem from a perception that only minimal changes can be seen on the ground, but Morsi's overall plan is also under fire. This plan was broken down on the Morsi Meter, a website created by activists to keep tabs on the president's promises. It published the 21-point plan for easing traffic, indicating the progress for each part. As of Monday, only 1 of the nearly two-dozen points has been achieved -- the removal of obstacles to traffic, such as street vendors or illegal building – while just three others are marked as being "in progress." The problem may be with some of the aims themselves. 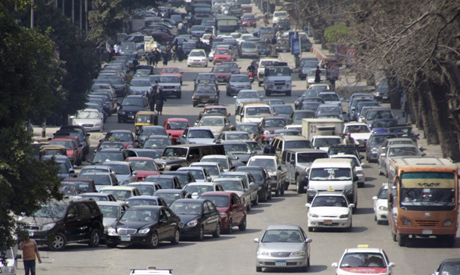 Traffic expert Magdi El-Shahed told Ahram Online that several points actually contravene existing traffic laws. One example, he said, is the stated plan to limit the movement of certain kinds of large vehicles in and around cities during certain times of the day. This, El-Shahed suggests, clashes with a law allowing heavy vehicles on the roads at any time if they pay a penalty fee. Such contradictions are also apparent when it comes to several other points, he claims. But perhaps the great problem, according to El-Shahed, is that the plan focuses on irrelevant points and ignores some of the greater issues. One example is the declaration that all taxi drivers will be obliged to install meters. “All cabs in Egypt have meters. The issue should be forcing driver to use them, not just have them," says El-Shahed. "But in any case, taxi meters have nothing to do with traffic congestion. They are irrelevant." Such stipulations suggest the plan itself "wasn't written by professionals," he says. One of the obvious means of easing traffic congestion would be to develop Egypt's public transport systems. The sector, however, is seeing its own problems, with angry employees staging periodic strikes to demand improvements in pay, facilities and working conditions. Morsi's 100 day plan didn’t address this issue. The head of the transportation committee in Egypt's now-dissolved parliament – a top-ranking member of Muslim Brotherhood's Freedom and Justice Party – even dubbed a recent transport strike an "act of treason." Last week's microbus strike led to the blocking of Salah Salem street in Heliopolis, one of Cairo's main thoroughfares. It came just days before Morsi’s speech in which he announced his partial resolution of the traffic crisis. The major problem, El-Shahed told Ahram Online, was the complete failure of authorities to try and put a plan – any plan – into effect. The biggest indicator of this, he believes, was the different interpretation that party figures and government officials had as to when the 100-day plan itself was launched. Some claimed it actually began long after Morsi's inauguration on 30 June. "This proves there was no clear plan for a beginning and end of its implementation. It shows there wasn’t even a strategy to begin with," El-Shahed contends. He says that different governors took their own initiatives to tackle traffic instead of following a clear, unified plan. But while Morsi's traffic approach has its critics, it seems the average Egyptian may be willing to give him the benefit of the doubt. A poll from the independent Egyptian Center for Public Opinion Research, Baseera, showed that by the 80th day of his term, 60 per cent of Egyptians approved of the changes they'd seen in local traffic. Three weeks before, the approval rate was just 40 per cent. Monday, however, marks the points where expectations meet reality. Only then will public sentiment show whether there is a rift between the president's sense of achievement and how Egyptians feel about their still traffic-clogged streets. Isn’t that nice! The president is trying to fix the traffic problem! What are the Governors and the Ministries are doing? I am a firm believer that if there is a FAIR system that is enforced on all those that commit any traffic violation, the problem will be solved. Traffic lights have to be immediately installed on all road junctions. Cameras to installed to monitor the traffic. Breaking a traffic light costs about LE9000.00 in some countries. If people cannot pay this amount then the better respect the traffic light or better not drive at all. If we cannot make this system working inthe next 6 month, then why not get a foreign company do it for us. We might accept it from them until our citizens are educated. But where is police by night? For instance, Thawra str. in Masr el Gedida becomes a rally circuit for motor-bikers. Their bikes engines make so much noise people cant sleep.